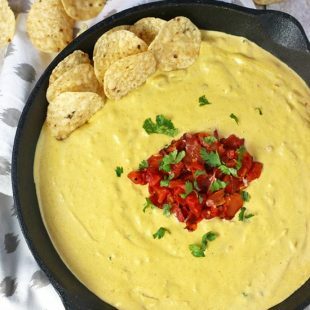 This amazing Vegan Chipotle Queso will satisfy any cheesy craving. It’s made with cashews and tastes just like the queso dip at Mexican restaurants but it’s dairy-free! Before my veg days, my sister and I used to love going to Mexican restaurants anytime we had a chance. We’d order margaritas and a big appetizer of queso dip and go to town on it – I mean, really go to town. I remember once the waitress coming back with our drinks about 3 minutes after giving us the queso and it was already gone. She looked at us like we were crazy. And to be honest, there were a few times we didn’t even order entrees, only the queso – one for each of us. Since going vegan I’ve missed my queso soooo much. I’ve tried numerous vegan recipes but nothing was as good as I remembered…until now. Today I’m sharing the BEST vegan chipotle queso dip I’ve had. That’s saying something because I was obviously OBSESSED with queso (well basically anything cheesy) before going vegan. I think I’ve said it before – I used to have a cheese drawer in the fridge that had my stash of cheese in it. That is how much I used to love cheese. 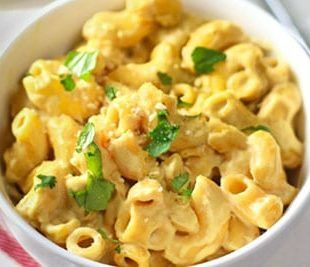 Now that I’m plant-based, I love finding tasty dairy-free replacements (like my Vegan Mac and Cheese, Pumpkin Mac & Cheese, Alfredo Sauce and feta cheese) and I think this queso recipe is one you’ll love too. I used cashews as a base for my Vegan Chipotle Queso. I thought they would work well because I’ve used them before to make things creamy like my Colcannon Soup and ranch dipping sauce for my Buffalo Quinoa Balls. This dip is a tiny bit spicy because of the chipotle pepper but my mom even ate it and she can’t handle spicy so it should be okay for those of you not into too much spice. If you’re like me and want more heat, add another half of a chipotle in. While every once in a while I do have some tasty tortilla chips, I usually like to keep things extra healthy and dip in carrot chips or other sliced veggies. I tested my Vegan Chipotle Queso on my sister (who still eats cheese) and she snarfed it up. She said she really couldn’t tell the difference between this and the queso we used to have – which is exactly what I wanted to hear! I hope you enjoy it as much as we do! 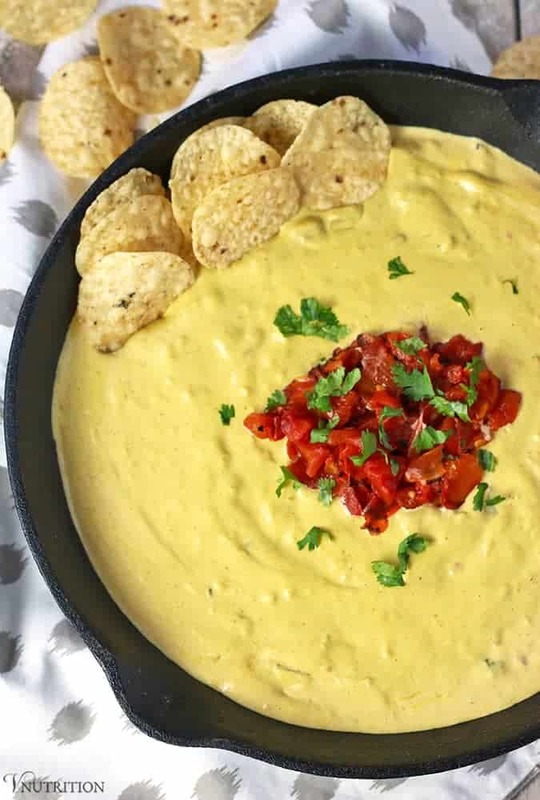 If you make this Vegan Chipotle Queso recipe, let me know what you think by ★ star rating it and leaving a comment below. 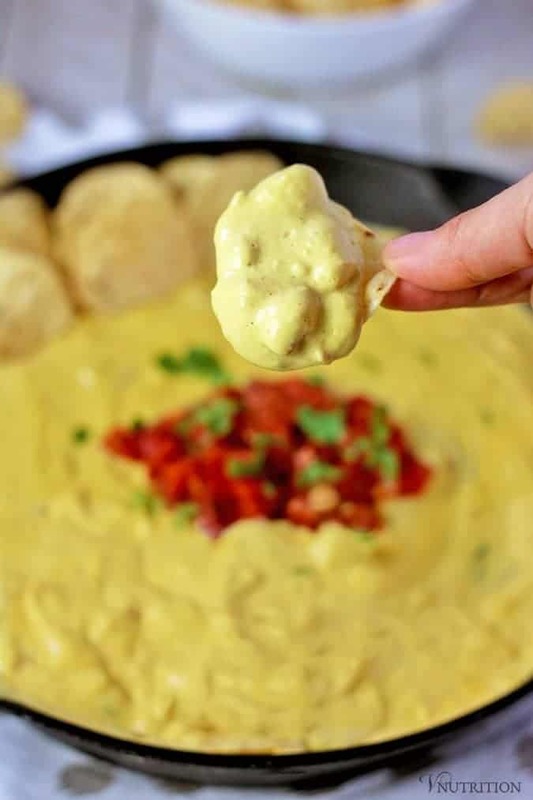 This amazing Vegan Chipotle Queso will satisfy any cheesy craving. 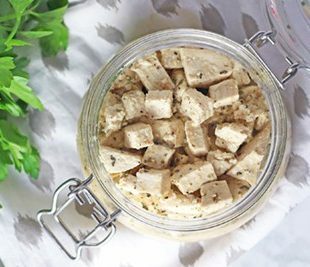 It's made with cashews and tastes just like the queso dip at Mexican restaurants but it's dairy-free! Add all ingredients (except tomatoes) into a high-speed blender* and blend until smooth. If it's too thick, add small amounts of water. You want it smooth but thick. Transfer mixture to saucepan/skillet and stir in most or all of the tomatoes. I like keeping some of the tomatoes as a garnish on top but you don't have to. Heat on low for a few minutes while constantly stirring until queso is warm. IMPORTANT: Make sure you keep stirring because I have found that cashew sauces burn or stick to the pan easily! Top with cilantro and tortilla chips and enjoy! If you don't have time to soak the cashews that long, you can put them in boiling water for 10-15 minutes. Holy moly, this looks soooo good! 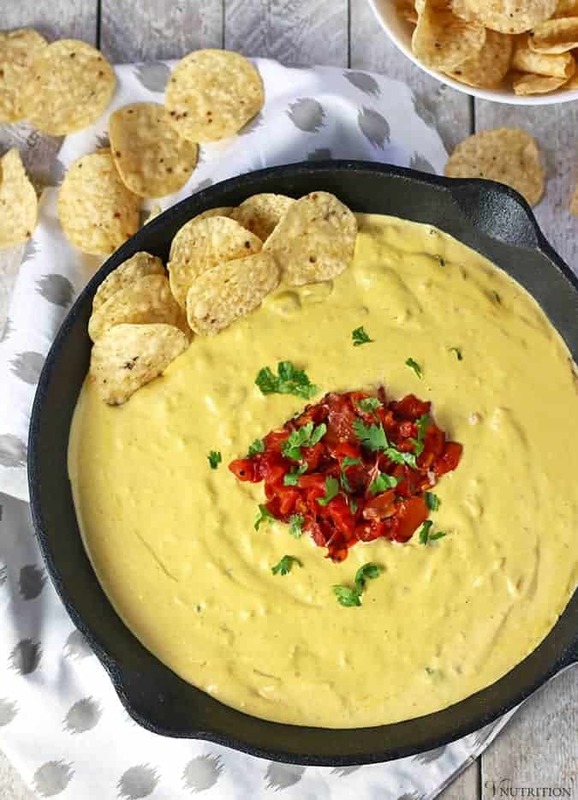 I love queso and definitely have to make this! Thanks so much Becky! Let me know what you think when you try it! This looks so good! I didn’t grow up on queso but fell in love when my friends would get the jars of it. I haven’t had any in YEARS though. Although I remember teese making a queso cheese that was pretty amazing too. This looks so good! I used to eat tons of jarred queso dip years ago before I went vegan. This is on my must-make list! Thank you Dianne! I used to eat that jarred stuff all the time! This is going to sound weird, but I don’t remember ever eating queso dip. I found out I’m lactose intolerant when I was in my teens, so if I did have it, it was a long, long time ago. I’m really looking forward to trying your version! It sure looks delicious! Johanna, yes, the cashews always make things so creamy and cheese-like! Let me know what you think of this Mexican-inspired version! I LOVED that stuff too! I would totally eat a jar by myself. A vegan queso party would be the best!!!! Thanks Christine! I hope it lives up to your old memories of queso! OMG this looks so good!!!! If your sister liked it – it must be pretty good if she couldn’t even tell the difference. That’s awesome! I actually started liking cheese more after going vegan (vegan cheese that is). I never really got much out of the dairy stuff. Definitely trying this out soon! You can make it without the chipotle. Actually when I was making thing I was thinking – “Kimmy will be scared of this pepper” lol. Thanks so much Margaret! I’m so glad you liked it! How much is a serving of the dip? Hi Maria. The dip makes about 3-3.5 cups and there are about 8 servings in the recipe so I would say probably about 1/4 a cup or so. Another recipe I would love to make, but I don’t do chipotle chile in adobo sauce due to sugar in ingredient. I checked every brand of it and they all have sugar in it, unless you know of one that doesn’t. I was thinking chipotle chile powder mixed in homemade adobo sauce, but not sure on measurements and I don’t want to compromise the flavour based on a rave review from actual cheese eater. Any suggestions? Thanks. 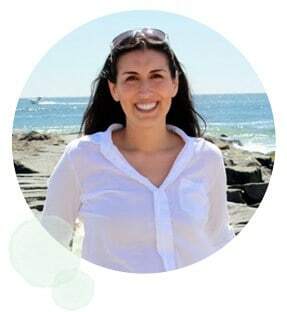 Hi again, Mary Ellen (it’s me, Fran, from the Alfredo Noodles love post!) I’m having a ton of fun exploring and trying out your recipes. Unfortunately, my pesky high-stress job gets in the way so my progress has been slow. But, I’ve set a goal of trying at least one of your recipes every week (wait till I get to be off for a whole week in April!). Anyway, this Queso was IT last weekend! Let me just say, you have completely changed my mind about cashew based sauces, this was AH-MAY-ZING!! 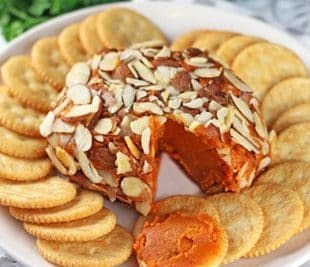 Again, I was reluctant to give Queso Dip a go because the last time I tried a similar recipe it was made with cooked carrots and potatoes as the base. Oh no, no, no! The cream still ended up gritty from the potatoes and it was such a disappointment. So I figured it was time I resigned myself to a life without Queso. But then, I found YOU, and you showed me THIS Queso, and now my life is whole again! Thanks for sharing! Hey Fran! Yay, I love hearing from you! I’m so glad you liked the queso. It’s one of my favorite recipes. Cashew-based sauces can be really good and creamy if done right.